The difference between these two impassioned outbursts? About 40 years. Henderson spoke his piece in 1973, four months after his return from Russia, in the middle what had turned out to be a terrible NHL season for him. Esposito’s spiel dates back, oh, about a month, to when the Russians announced that with the Summit’s 40th anniversary coming up in September, they were organizing a bit of a reunion for the 1972 crew in Moscow. Which they did. Happened this past weekend. There was a hockey on Saturday involving an all-star(ish) crew of (mostly) post-’72 players with names like Bure, Fetisov, Anderson, and Duguay. The festivities kicked off, though, on Friday, when a delegation of Summit dignitaries paid a visit to Russian Prime Minister (and huge hockey fan) Vladimir Putin’s dacha outside Moscow, followed by a state dinner. 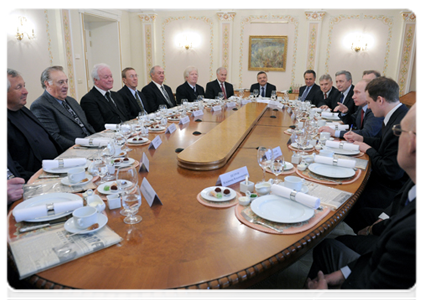 You’d think Putin would be too busy to meet with hockey players, what with all the pretending nothing’s going on in Syria he must have to be working on, not to mention lots of eleventh-hour voter suppression ahead of next week’s presidential elections. 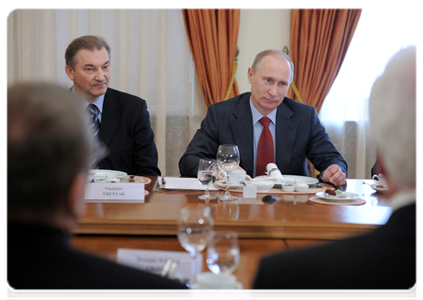 But, no, Putin had them all ove to his place, the hockey players to commemorate what he called “one of the ice hockey milestones of the 20th century.” Vladislav Tretiak was there, and Alexander Yakushev, Boris Mikhailov. On the other side of the table, there was Dennis Hull and Marcel Dionne and Jocelyn Gouvrement, Don Awrey, Pat Stapleton. It was not only the fact that top government officials turned their attention to hockey and became, in fact, directly involved in the events, but the change in most people’s attitudes toward ice hockey and toward sports in general. Moreover, major international sporting events were seen in the context of the day’s international politics. Therefore, despite the tensions of the times, the 1972 championships promoted and encouraged more normal, human relationships between people. Which was nice of him. Answering on Canada’s behalf was — wait. Who was that guy speaking up for the Canadians, anyway? Not — really? No. Are you sure? 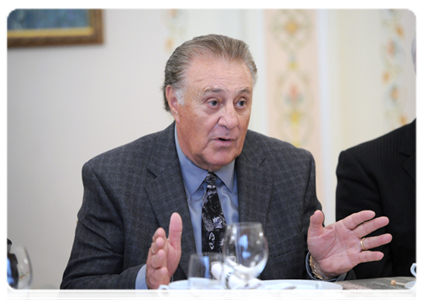 Phil Esposito himself? In person. This was going to be good. Was he truly going to tell Putin how much his people stink? Maybe was Henderson there, too? Was he going to let loose once Espo was done, probably? No, no Henderson. Just Esposito, seemed like. Still. Anyway. Esposito was plenty. He wasn’t just going to sit there and listen to Putin’s patter. The man Yevgeny Yevtushenko called Canada’s best poet? The guy who blasted Canadian fans for booing our boys in Vancouver in 1972? Did he ever pull a punch in his life, that you’ve heard? What would he do to the Putinator? Had he already got his cash for showing up? Was anybody going to be left standing when it was all over? Before the Summit Series, we had no idea how good the Soviet players were. You were just brilliant! We thought it would be just an all-stars game, nothing serious, just playing for the public. But it was the most challenging and the most exciting series of my life. There was nothing like it before that. You were playing with such passion, so we gave it all we had, and the series turned out to be the best of its kind. I could say a lot more, but once again, thank you for organizing this meeting. I’d like to add this. I have three grandchildren, and they are half-Russian. My second grandchild, Nick, will make a very good player in time.